Seattle Seahawks running back Derrick Coleman fronted an evocative video about not taking no for an answer. Derrick Coleman is making his mark with the Seattle Seahawks. 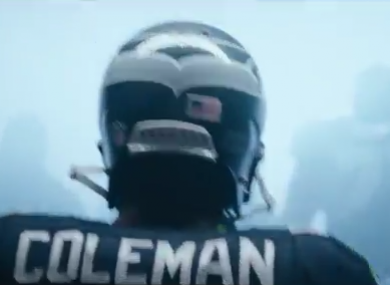 NFL STAR DERRICK COLEMAN has starred in an inspirational advert that encourages people to follow their dreams, no matter what obstacles are in the way. The Seattle Seahawks running back, who has been legally deaf since the age of three, appears in a Duracell advert calling on individuals to ‘trust the power within’. The 23-year-old from California was not originally selected by any of the major franchises in the NFL draft, in 2012. The Minnesota Vikings took him on as an unsigned rookie but he did not make their roster for 2012/13. Despite the setbacks, Coleman, who plays with a hearing aid, impressed so much in training with the Seahawks that he was included in the team roster ahead of incumbent running back Michael Robinson. Email “This inspirational video from a deaf NFL star should brighten your day”. Feedback on “This inspirational video from a deaf NFL star should brighten your day”.